1. Read the poem from which the words were taken. Use any part of it, title, line, phrase, as a title or epigram for your poem. 2. Remember, you do not have to use all of the words, and if one of the words offers inspiration on a different tangent, that is just fine. 3. We are nearing the end, so pamper yourself a bit, do something just for you. This entry was posted in NaPoWriMo Poetry Prompt #25: Day 25 and tagged NaPoWriMo, poem a day, poetry prompt. Bookmark the permalink. There are dragons in her soul and a compass in her heart. 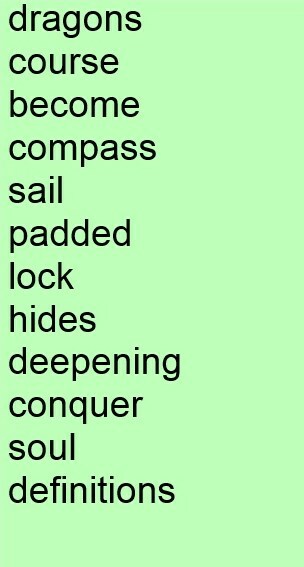 She sets her course with sails at her heels, locked in the definition of wind and riding into conquered hides. She has become the deepening of her muse’s imagination. And she writes. Lol, Misky…last night I clicked on the edit button and watched my entire post disappear forever, without the one word I was intending to add to it. LOL! But, still, I have no idea how that happened. I post directly to the screen editor on my page. So odd. Three of your words popped out at me, Elizabeth. A bit late to the party, as often happens with me. Smiles. I’m cackling loud and clear just to see you here, Sherry. Thank you, you made my day. Thanks for being here, Elizabeth. Here it is. I want to explore these words further, and am glad this is day one with this list.